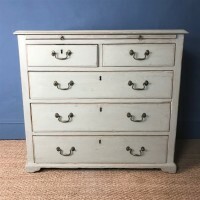 A George 111 small painted chest of drawers circa 1800 with a brushing slide above two short and three long graduated with original brass swan neck handles on bracket feet . 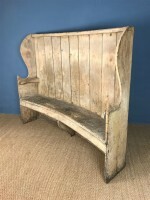 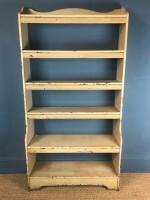 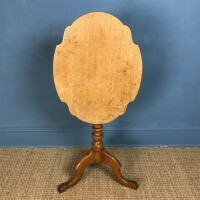 An 18th c painted elm Dorset settle in totally original condition with a lovely untouched crusty patina. 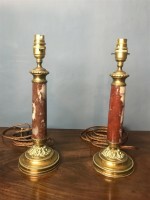 In excellent solid condition and a rare survivor from before 1800. 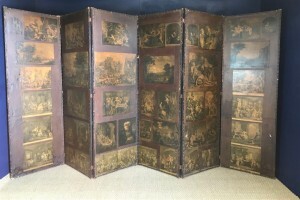 An enormous Victorian Irish 6 fold Country House leather screen circa 1880 covered in 18thc engravings including Hogarths Marriage a la Mode and Claudian landscapes. 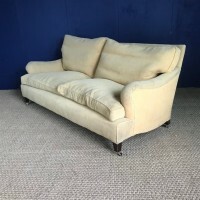 192 inches wide 90 inches high each section 32 inches wide and folds together for transportation. 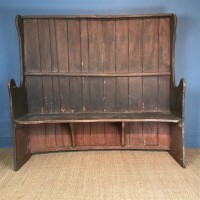 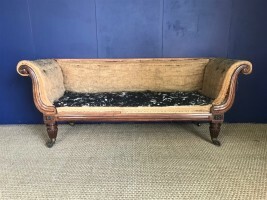 An early Victorian mahogany window seat circa 1850 in good solid condition. 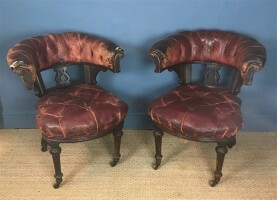 A pair of overscale Victorian oak library chairs circa 1890 with the original red leather upholstery in lovely worn but useable condition . 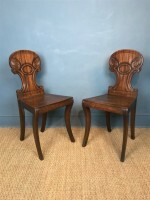 A pair of Regency mahogany sabre leg hall chairs circa 1820 in the manner of Gillow with a lovely original patina .. old breaks to the back legs . 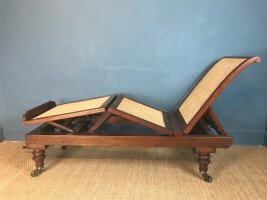 A Victorian walnut and cane campaign day bed circa 1890 by Carter of London in perfect original condition with wind out mechanism and original ivorine makers label on turned legs with brass patent spoked castors. 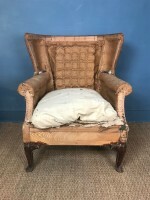 An Edwardian walnut Cabriole leg Wing armchair circa 1910 in excellent solid condition stripped down and ready for recovery. 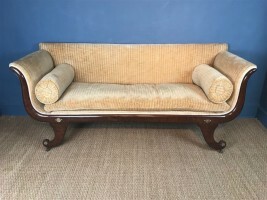 A 1920’s two seater Howard style Sofa on mahogany square tapering legs cappings and castors. 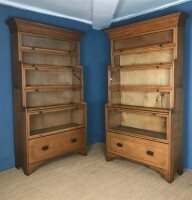 A Somerset painted pine dresser circa 1830 with the original terracotta red paint in excellent solid condition. 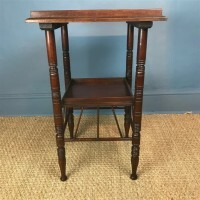 A late 19th c folding ladder chair circa 1880 Cumbria with the original painted decoration . 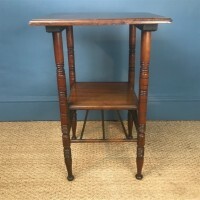 Read more: A late 19th c folding ladder chair circa 1880 Cumbria with the original painted decoration . 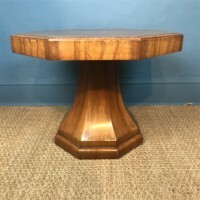 An Aesthetic Movement walnut 2 tier table c 1880 after a design by E W Godwin . 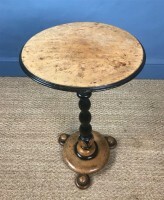 An Aesthetic Movement walnut 2 tier table circa 1880 to a design by E W Godwin. 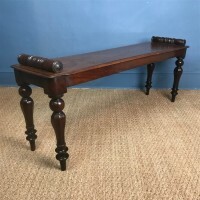 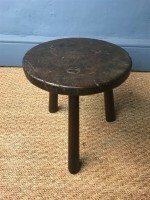 An unusual mid 19th c oak tripod table circa 1840 with honey coloured cartouche shaped top on turned column and tripod supports. 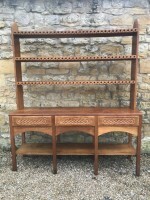 An Arts and Crafts oak dresser in Celtic Style circa 1930 probably Lakeland or Hampshire workshops the rack and drawer frieze carved with bold interlocking Celtic motif.